Excuse the sneaky bra poking out, I am gonna wear a top under this when I go out as I didn't realise quite how revealing this dress was. I've had my eye on this dress for ages but I never got round to getting it. I really should have bought the smaller size but I cant be bothered with the faff of returning it! I only paid £22 as there is a £10 off code you get sent when you make your first order from the website. So it's not too bad. I love the elephant grey colour and the shape, I don't have anything like this so it was a nice addition to my wardrobe. I would say that it's a bit gutting as I expected it to be long enough to actually be a dress (Im 5ft5) but It shows way too much off so I paired it with some leggings instead! I can confirm that these shoes hurt like a beeeeyatch. Despite how pretty they are they are super painful & I've got a few blisters but Im determined to break them in so Im wearing them out tonight to an event! I'm off to a Boohoo event with a ton of other bloggers to the Ice bar! I've never been before so Im super excited about going. It's on my list of things I want to do but never actually get around to doing! Love grey for winter! The dress looks good with the disco pants! This outfit looks amazing! Love the dress. I'm so in love with this dress !! Lovely outfit, the necklace is amazing! Great outfit the dress looks great!! This is beautiful! might have to get this dress! Ooooh Lily this outfit is incredible! So simple yet so beautiful! In love with the shoes, want some ankle straps! necklace and micradermals look nice too! I know I have this dress is teal, nice to know its too short on you thought it was just one of the perils of being tall. Hell, you've sold me on that wrap dress - looks AHmazing on you! love the elephant grey colour! looks great on you! That dress is just gorgeous, I want it! This is by far my favourite outfit of yours Lily. I love the dress and shoes. This would be a great going out outfit. and I love the look! I have only recently started my own lifestyle blog and would love to hear what you think of it. If you still haven't broken your shoes in then apparently sleeping in them works wonders! Love this outfit! love the dress, love the shoes, love the make up, love everything! Your blog is my new favorite one to read! Also love your youtube video! Grey is my favourite colour, so versatile. Still going crazy over those shoes too... if it wasn't so cold already I'd snap them up right now! Ah, do I don't I?! Absolutely my fav of all ur outfits! Gorgeous dress and I love the hat! Have fun at the Bohoo event! gorgeous dress, the color and cut are so flattering! Your hair colour is so lovely! My boyfriend's got me the petrol green version of this dress for Christmas, I can't wear it as a dress either though as I'm 5ft 7". They should definitely make them longer!! I'm not too fond of the shoes tbh, but your taste is yours! I used to want this dress but was never too sure. It was featured bloody everywhere in the same too colors, that green-blue, and black. I rarely saw the gray version, but it looks lovely! Shame about the length of it! Looks as if your bum hangs out from it. 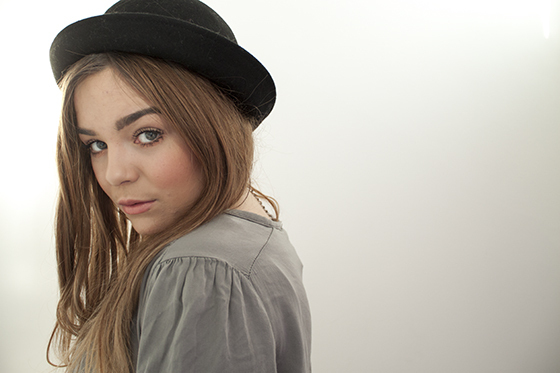 Beaut, wish I had the confidence to pull off a bowler! Are the leggings the disco pants, or the thinner high waisted actual leggings? Visit my fashion & lifestyle bits blog here. Most recent posts include cute iPhone cases and H&M and Topshop hauls! I know what you mean about this dress. I ordered it in teal and sent it back as I thought it was indecent!! I've wanted this dress for ages from love, I always get tempted when they do flash 40% off but never got round to it. I might have to now though as I love how you're wearing it. Especially how you've made it into a tunic top rather than a dress. Clever idea. Those shoes look a bit painful, but so beautiful nonetheless! I really like the shoes, hope they weren't too painful. Love this dress the colour and style really suits you! I've actually bought this dress after seeing it on you. I'm going to a wedding in December and I think this will be perfectly Wintery all styled up with sparkly accessories, leggings and ankle boots. I may have to buy a fur coat for the occasion too! I really love this colour on you! Thank you for being honest about the shoes hurting, I usually just grimace and lie about them being "like walking on clouds". Stop by my blog if you can, mine is all about thrifting and saving money; plus I just did a post on my new Paraders dress and a floral crown, plus I'm doing a give-away tomorrow! Hooray! Thanks so much! I made a post about you on my blog, please come and see! great look!!!! love the color of the dress and your hair ! Is this offer still on, I cant find it on the website? Im so in love with these shoes! This is so beautiful! I like the cheeky bra! I just love everything in this outfit! You look stunning! this is the most beautiful thing i've seen you wear! want to buy it straight away! Love this look. The hat and dress combo is brilliant! LOVE this outfit!! You look gorge!! I bought this dress in the petrol colour for a party this week... im gunna try and get away with wearing it with tights but it really is SO short... Hmm!! Looks lovely though! Absolutely love this dress, you look stunning!